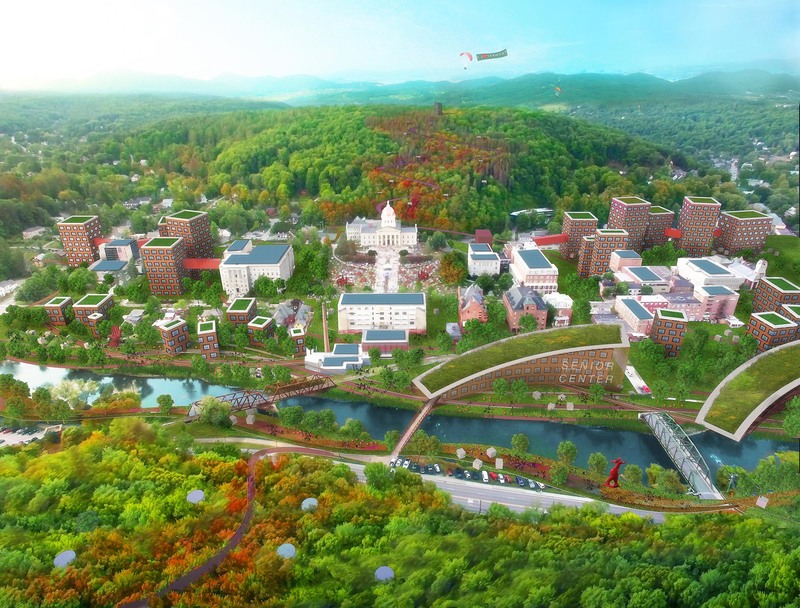 Montpelier 2030 is a city plan to make Montpelier more sustainable, collaborative and diverse. People can live, work and play in downtown Montpelier without the need to use motor vehicles. A series of programmatic and urban strategies is used to increase the city’s performance on collaboration, livability, walkability, energy, water and air. 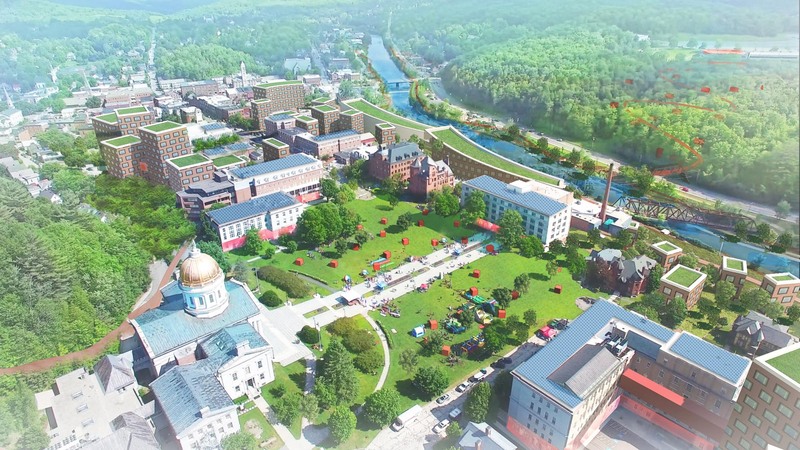 The goal is to make Montpelier the greenest state capitol by 2030. 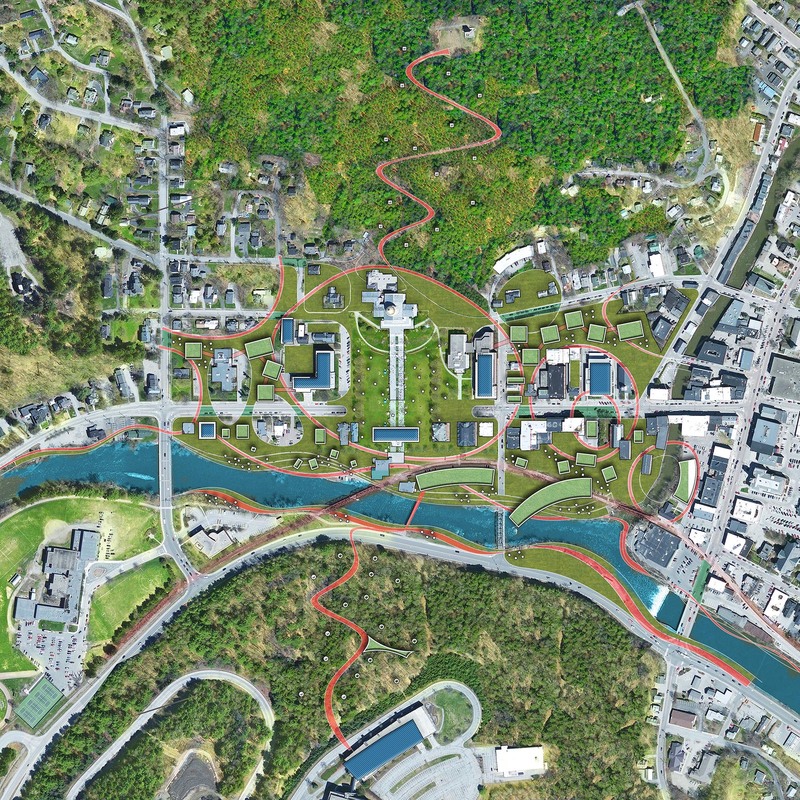 The master plan is inspired by Winooski River. The river-like geometry forms a continuous walking loop around downtown. It travels at grade, on bridges and underground. The biggest improvement to the current layout is the extension of civil plaza in front of the State House. The new art plaza will connect to the riverfront. One section of State Street will be lowered below the new plaza to allow for a carless experience. The storefront of those civil buildings will be re-activated to encourage cross circulation and ventilation. This unified plaza will help to reconnect people to the government while its architecture and landscape will no longer be distinguishable. Various renewable technology such as clear solar panels on windows will be deployed on new and existing buildings along with energy efficient design. To reduce water usage and pollution, new terraced bioswales will be built along the banks of Winooski River. Each layer will work like a filter to absorb different pollutants while serving as a riverfront park. Permeable pavers, greenroofs and grey water recycling will further reduce water runoff. With the help of big data and cellphone monitoring, both the city and residents will be able to control their utilities usage in a holistic way. This combination of physical and digital technique will make our sustainable approach a work of art and science. New Transportation center will serve as a rental hub for bikes, drones, cars and mobile offices. People will no longer need to buy and maintain their vehicles or offices. They can travel lighter and faster. Rental is the new economy for 21st century. In fact, sharing economy will be a key component in our masterplan. The goal of sharing amenities is to reduce the overall carbon footprint by lowering the need of private amenities. The extension of walkway toward the mountains is to diversity the spaces available downtown. It will blur the boundary between work and play. Within 15 mins of walk, people can work in the forest during the day and go back home downtown at night. The idea is not to provide the most efficient layout but to create an abundance of break out spaces and buildings at various density. Diversity is to key to attract young people and creative businesses. Montpelier Net Zero 2030 is a city plan to make Montpelier more sustainable, collaborative and diverse.